The Edwards EH250 Booster Pump features twin Roots lobes driven by a hydrokinetic drive mechanism that allows the pump to slip at high pressures to avoid stalling and provide pumping assistance from nearly atmospheric pressure. 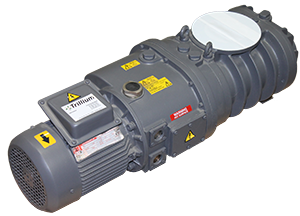 Like all blowers, it requires a suitable backing pump such as an Edwards E2M40 and E2M80. All EH250 Series booster pumps share the same data below. Download the full manual below.